A typical doctoral student completes a minimum required 24 credit hours of course work and 12 credit hours of dissertation work. Course work includes a minimum of seven 2-3 credit graduate lecture courses, 5 credits of research, and five 1 credit seminar courses. Students must take BIOL 6005: Scientific Writing Workshop as one of their five seminar courses. All students must enroll in BIOL 6952: Department Colloquium during each term in residence. Course selection is individually tailored to the student's specific career goals and prior academic background. Upon joining the program, each student consults with an advisor who considers the student's interests and undergraduate coursework and helps chart the first year of study. Once a student has a formal research advisor, the student's course of study is guided by a Ph.D. or M.S. advisory committee chosen by the student and the research advisor. Important in every student's program are the seminar courses, in which small groups of students and faculty examine in depth the current literature on specific topics of widespread interest. Besides the courses available at Marquette University, students may enroll in courses offered at other nearby graduate institutions. A minimum of 2 seminar courses taken after the completion of the qualifying exam (to a total of 5 seminar credits). The major endeavor of any student is the research that culminates in a dissertation or thesis. This research must be original and meet the highest standards of quality and thoroughness. The breadth of the department provides a diversity of research fields from which to choose. To help in determining the best fit of student and mentor, first-year students do three laboratory rotations. During the rotations, students are temporary members of the laboratories whose research appears to be of greatest interest to them. Before the end of the student's second semester, an advisor who guides both research and selection of coursework is chosen by mutual agreement between faculty and student. The relatively small size of the research groups in this department allows students to interact closely with the faculty. Manuscripts arising from dissertation research are published in highly-respected peer reviewed journals. The program offers a diverse range of research emphasis groups such as: Biochemistry, Neurophysiology, Evolution, Cell Biology, Developmental Biology, Genetics, Molecular Biology, Microbiology, Ecology, or Physiology. In some cases, students select research projects that include more than one of these fields of study. Several labs are taking molecular and structural approaches to study key metabolic enzymes and oligomeric protein complexes in prokaryotic and eukaryotic systems. These approaches include protein engineering, enzyme kinetic studies, X-ray crystallography and protein complex composition analysis to determine the function and regulation of key enzymes involved in diverse cellular processes such as gene expression, motility and central metabolism. The cell is the fundamental unit of organization in living organisms. Cell biologists seek to elucidate the principles whereby cells are organized structurally and functionally. Developmental biologists discover how cells differentiate, communicate and associate with one another over time in the development of an organism. The Cell and Developmental biologists at Marquette are a highly interactive group. We use diverse approaches including genetics, molecular biology, bioinformatics and imaging, to investigate cellular and developmental processes in a wide variety of model organisms such as C. elegans, Drosophila, Arabidopsis, Chlamydomonas and yeast. Specific research topics include analysis of cell motility, extracellular matrix development, mitochondrial biogenesis, and the timing plant flowering. This emphasis group offers a comprehensive training in techniques used in molecular biology and genetics. You can expect to clone and express genes in organisms to study protein function, test gene expression using real-time PCR and/or microarray analysis. From classical Mendelian genetics to reverse genetics, students choosing an advisor in genetics will learn the fundamentals of gene duplication, segregation and maintenance. You can expect to obtain a good understanding of how genes are manipulated in organisms at a genomic level in order to determine gene/protein function. Specific areas of research in this emphasis group include epigenetic regulation of gene expression, DNA rearrangement, microRNA biology, mRNA splicing, and tRNA biology. The Ecology and Evolution group is rapidly expanding at Marquette. Current research projects seek to understand the forces that structure plant communities, maintain species diversity, control species distributions, and allow species to coexist as well as studying the evolutionary processes that generate and maintain biological diversity. In this research group we want students to learn in depth how microbes function as organisms. Microbes have unique properties that allow a single cell to propagate autonomously and perform activities that higher organisms are incapable of. However, students learn that in nature a microbial cell is almost always interacting with other cells and organisms. Symbiosis is a particular research emphasis, but so are a range of other less intimate associations. Students come to appreciate how microbes cope with diverse, often seemingly harsh, habitats and how they have tremendous effects on their immediate environments and the entire globe. In order to perform research in this area, students receive training in molecular biology, biochemistry, and genetics, as well as specific training in microbiology. The primary focus of this emphasis group is on muscle, nerve, and epithelial physiology with formal course work in these disciplines emphasizing molecular, cellular, and systemic physiology. The goal is for our students to obtain an in depth knowledge base in physiology while appreciating and being able to incorporate molecular techniques into their research programs. Students will learn whole organ and single cell physiology techniques. Areas of current interest include osmoregulation, epithelial transport, ion channel structure and function, smooth, skeletal, and heart muscle physiology, neurobiology of locomotion, signal transduction, cell motility, energetics, and exercise physiology. Undergraduate education is a very important activity of the research faculty at Marquette. Every graduate student gains experience in this endeavor by observing and by participating first-hand as a teaching assistant for at least two semesters. Recognizing that college teaching is often a major activity of Ph.D. graduates, yet traditionally one neglected in graduate training, the Marquette Graduate School participates in an innovative instructional program entitled “Preparing Future Faculty” for graduate students interested in teaching careers. Several graduate students in the Department of Biological Sciences have been very active participants in this program. Some of our graduates have sought faculty positions at liberal arts colleges directly upon graduation and have been remarkably successful. Students gain experience in presenting their research before audiences in several settings. Individual research groups have weekly meetings for the purpose of exchanging ideas and results. Some research groups have combined meetings to provide broader input. After the first year, each student presents his/her research problem and findings at a "mini-seminar," a presentation of fifteen to twenty minutes to the entire department. Some faculty and graduate students participate in local scientific interest groups where students present their own research. Each year, many graduate students deliver research presentations at national and international meetings assisted by departmental travel funds. Students participate in one or more journal clubs that meet once a week to critically review an important recent publication. Because of the diverse research interests within the department, these gatherings and the other informal interactions between members of different laboratories give our graduates a wide breadth of perspectives on biological problems that become invaluable as they start research and/or teaching careers. Eminent scientists are invited to the department to deliver seminars on Friday afternoons, and students have ample opportunity to engage these scientists in individual or group conversation. The Department of Biological Sciences is committed to the full 12-month support of each Ph.D. student in good academic standing including an 18-credit tuition scholarship and stipend. Support is provided by teaching assistantships, federal grant-supported research assistantships, as well as additional fellowships provided by the University or by private foundations that are awarded on a competitive basis to Ph.D. candidates that qualify. The nine-month academic year stipend for 2018-2019 will be $23,040 plus a summer stipend. A select number of Ph.D. students may be supported by GAANN Fellowships. Fellowships are open to full-time doctoral students who are United States citizens or permanent residents with demonstrated financial need. Members of underrepresented minorities in biological sciences (African-Americans, Alaskan Natives, Native Americans, Hispanics, Native Hawaiians, Pacific Islanders) are especially encouraged to apply. The Department of Biological Sciences offers a Ph.D. and Master's degree in Biological Sciences . *Please note that while we offer a Master's degree in Biological Sciences, we are not actively recruiting for Master's degree candidates at this time. Do I need a Master’s degree to apply? Are students accepted for Spring or Summer terms? Most of our incoming students are admitted for the fall term. Applications are reviewed starting in mid-December. Applications may be occasionally considered for spring or summer terms. For full consideration, applications should be submitted by December 15th for admittance for the fall term. All applications must be submitted online through the Marquette University Graduate School. Who needs to take the TOEFL and when does it expire? Applicants from non-English speaking countries must provide a TOEFL score, or another acceptable proof of English proficiency. Test scores may not be more than two years old. Typically, successful candidates to our program have TOEFL scores of at least 90. The Marquette University institution code is 1448. Is there a minimum GRE score or GPA needed to be admitted? No, our program does not have a required minimum score. The application is considered in its entirety. What is the GRE code for Marquette University? The Marquette University institution code is 1448. No, the biological sciences graduate program does not require a subject test. On average we receive about 85 applications and admit a cohort of 5-9 students each year. Do you accept Conditional Enrollment? Test of English as foreign language (TOEFL) scores (for applicants from non-English speaking countries) or other acceptable proof of English proficiency. 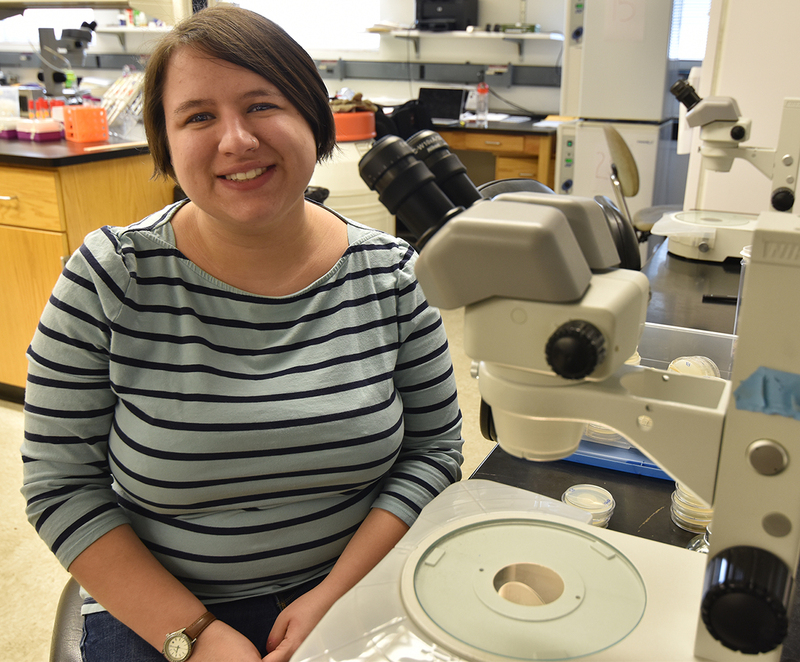 The Department of Biological Sciences is committed to the full 12-month support of each graduate student in good academic standing, including an 18-credit tuition scholarship and stipend. Ph.D. students are supported by teaching assistantships or by federal grant-supported research assistantships. Additional fellowships provided by the University or by private foundations are awarded on a competitive basis to Ph.D. candidates that qualify. The nine-month academic year stipend for 2018-2019 will be $23,040 plus a summer stipend. A select number of domestic Ph.D. students will be supported by federal GAANN Fellowships. How do I choose my lab? Faculty members will present their current research to first-year students at the start of the fall term. After these presentations, students will identify three faculty members in whose labs they would like to work. Students will do three lab rotations to help identify which lab is the best fit for their Ph.D. research. Following the three lab rotations, students will be matched with a Ph.D. research mentor, according to both student and faculty preferences. Can I be accepted directly into a lab? No. All first-year students need to complete three lab rotations before being accepted into a lab for their Ph.D. research. Recognizing that college teaching is often a major activity of Ph.D. graduates, students in the Biological Sciences graduate programs gain experience in the classroom by observing and participating first-hand as teaching assistants for at least two semesters. All courses in the Biological Sciences department at Marquette are taught by faculty members. Through Marquette's Preparing Future Faculty program, you’ll be trained for success as teacher-scholars. Isn’t Milwaukee too cold in the winter? Well…sometimes. Winters in Milwaukee are highly variable. In some winters we see chilly temperatures and lots of snow, while other winters are much more mild. The average high temperature in January is 28°F (-2°C) and the average low temperature in January is 13°F (-11°C). On the flip side, summers in Milwaukee are beautiful, with average high temperature in July is 81°F (27°C) and the average low temperature in July is 63°F (17°C). Is Milwaukee a welcoming city for international students? Yes! International students find Milwaukee to be easy and fun to explore. Marquette has a large population of international students who can help you get involved in local culture. Our program includes students from a diverse range of nationalities. What is there to do in Milwaukee (Arts, Theater, Sports, Restaurants…)? A lot! Milwaukee is a great combination of a big city and a small city. It has all the arts, culture, restaurants and big league sports of a big city, but fewer of the drawbacks, like traffic or pollution. Milwaukee hosts a series of summer festivals including the world's largest music festival, Summerfest, and many ethnic festivals.